This JointHealth™ podcast is intended as a "primer" for listeners wanting to know more about how to get started on the best treatment path for their rheumatoid arthritis, ankylosing spondylitis or psoriatic arthritis. 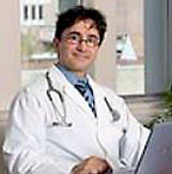 Monitoring for side effects delivers "peace of mind"
Dr. Shojania is a leader in the field of rheumatology. His research specialty is the efficacy of different medications on the treatment of rheumatoid arthritis.